Leading Perforated Acoustic Panel Manufacturer Supplier. Acoustic Slats APPLICATIONS : Acoustic correction. Applicable to walls and ceilings. Installation: The different plates are available with different finishes depending on the type of perimeter assembly desired. Envirotech designs and manufactures acoustic and decorative panels for walls, ceilings and furniture in auditoriums, theatres, restaurants, hotels and all kind of interior projects which require technical designen requirments. Perforated Acoustic panel supplied in the form of modular slats with special sound absorption characteristics and excellent. Installation result. Acoustic panel system with high technical and aesthetic qualities. At the technical level it has a high absorption coefficient. Aesthetically it has a linear design, elegant and discreet, very suitable for acoustic conditioning that requires a high level. Acoustic correction with high aesthetic level. Applicable to walls and ceilings. Envirotech products have a reputation for reliability as we are dedicated to researching and testing every product from certified laboratories for STC and NRC ratings to suggest best product as per site needs. 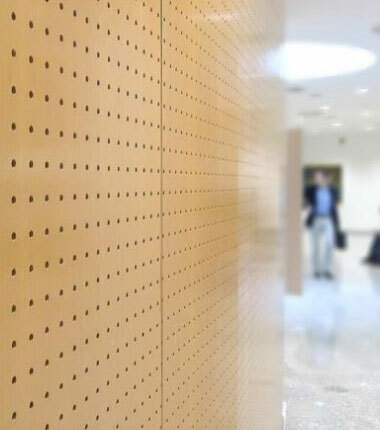 Perforated panels are the most economical way to get an acoustic treatment with a high degree of absorption. With several variations of patterns and hole diameters, different levels of absorption and aesthetic results can be achieved. Dimensions: There are versions in large dimension panels for continuous walls and ceilings and also standardised ceiling panels in different versions to install with visible, semi-hidden, hidden and hidden practicable profiling. The panels may incorporate to the back and as an option, an acoustic veil to improve the sound absorbing qualities of the panel. The Noise Reduction Coefficient (NRC) is a scalar representation of the amount of sound energy absorbed upon striking a particular surface. An NRC of 0 indicates perfect reflection; an NRC of 1 indicates perfect absorption. In particular, it is the average of four sound absorption coefficients of the particular surface at frequencies of 250 Hz, 500 Hz, 1000 Hz, and 8000 Hz. These frequencies encompass the fundamental frequencies and first few overtones of typical human speech, and, therefore, the NRC provides a decent and simple quantification of how well the particular surface will absorb the human voice. A more broad frequency range should be considered for applications such as music or controlling mechanical noise. 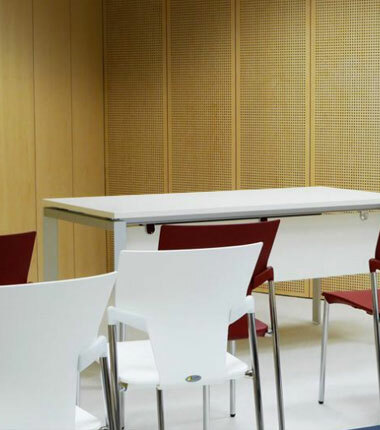 Specifications for materials used in sound absorption commonly include an NRC. Acoustical materials manufacturers often report NRC values higher than 1.0 due to the way the number is calculated in a laboratory. A test material’s area does not include the sides of the panel (which are exposed to the test chamber) which vary due to its thickness. A certain percentage of the sound will be absorbed by the side of the panel due to diffraction effects.